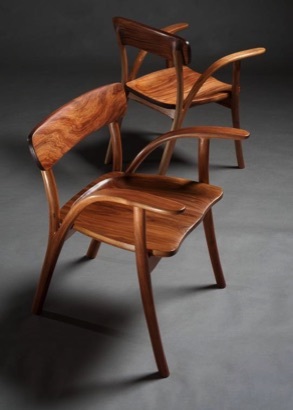 The Leonardo chair was designed to go with the Leonardo table but now can be made to order. So many dining chairs are adequate for dining but are impolitely uncomfortable for any longer. This chair was designed to relax and even lounge into after the meal, and made sturdy enough to withstand vigorous conviviality. The meticulously hand shaped form is a delight to see and touch. The curvaceous form embraces your body. It is made of sustainably sourced Tasmanian Blackwood, and finished with handrubbed coats of Osmo Poly X, a very durable natural oil finish. 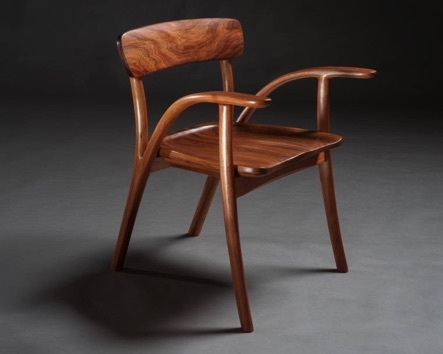 The price per chair is AU $5,500. plus gst if applicable. The charge for delivery outside of Brisbane will need to be arranged.